We’ve noticed for many of our users that adding text to magazine pages can be quite a daunting task. Today we aim to show you that anyone can write text for their magazine. Our main goal here, after all, is to enable users, regardless of experience or know-how, to create their very own magazine. 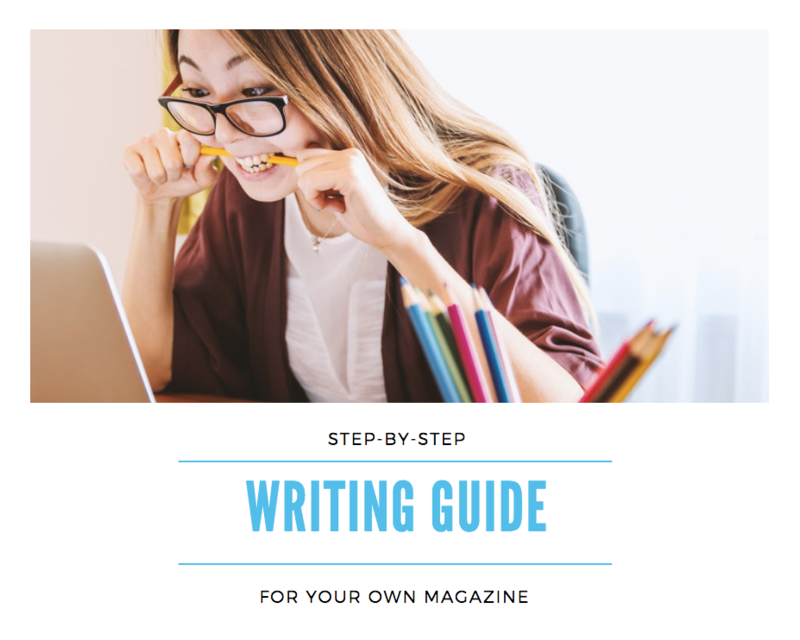 We’d like to help you by providing a step-by-step guide on how to write your own article for your magazine. A good thing to keep in mind is that an article doesn’t have to be extremely long to be a good addition to a magazine page. In fact, if you take a look at your favorite magazines, we’re sure you can find examples of articles written as well as of pages with minimal text. It’s all about how you format the pages and place text. Text is more than just the word count. Outlining, font, and size also all come into play to create a text that compliments a page. The most important thing to keep in mind however, is whether the article is useful and makes sense to the reader. Brainstorm and write everything down. You may need to think of a topic yourself, or maybe you’ve received a topic you need to write about. Start by writing down a headline and subheadings pertaining to the questions that need to be answered in this article. This outline, along with the questions you’ ve asked yourself in step 1, will help guide you as you work on your article. If you feel overwhelmed at any point during the process you can come back to this outline and regroup. How you execute this step largely depends on what kind of topic you’ve chosen. A lot of information can be found on the internet, but people are a good source as well. Do you need information about a couple for a wedding magazine? Ask friends and family about their relationship. Do you need information on someone’s childhood for a birthday magazine? Try asking their childhood friends or try getting your hands on photo albums. Do you need information on a specific topic for a school magazine? Try researching on the internet (make sure the source is reliable!) or ask your teachers. This part is important. At this stage it’s important to just get as many words as possible down. Don’t worry about spelling or whether or not the article makes sense, you’ll organize everything you wrote down in the next step. Get rid of any excess information and organize the writing in a way that makes sense for the reader. That’s it! Please let us know in the comments if you thought this article was useful. If you have any questions you want answered or if there are other topics you’d like to see us write about let us know!